Get our new posts directly in your inbox! Disclosure: I may earn money or products from companies mentioned in this post. I only recommend products and services I trust to serve you. Purchasing through an affiliate link comes at no extra cost to you. You can learn more here. 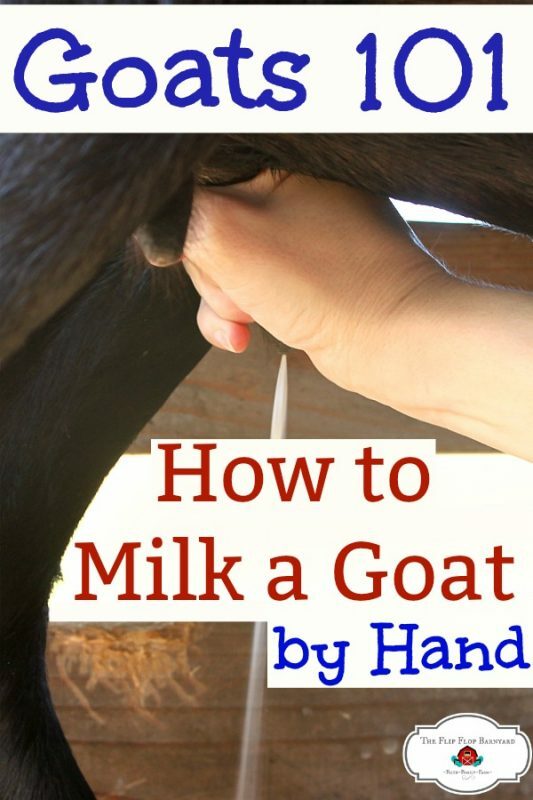 When you milk a goat, you’ll find it is very similar to hand milking a cow. Of course, goat teats tend to be smaller than cow teats. Their teats also vary greatly in size depending on breed and genetics. I’ve milked Nubians, Nigerian Dwarfs, and Alpine breeds of goats. I have found the Nubian and Alpine goats to have large enough teats to milk easily like a cow. The Nigerian Dwarf goats are much smaller and can be a bit trickier to milk. 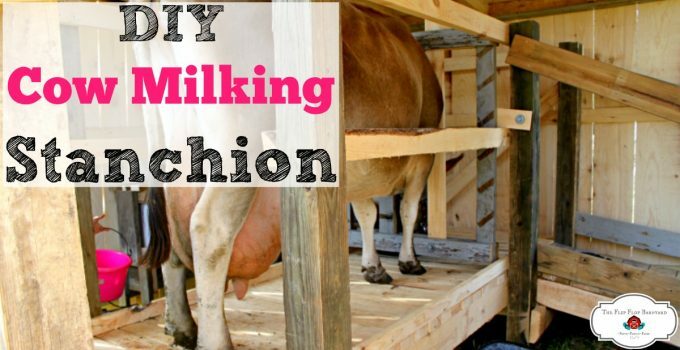 Even with the varying sizes of teats, the methods of milking is still the same for me. I’m sure there are other people out there who milk differently than I do. You’ll also want to gather all of the proper milking equipment so that you’ll have all you need to milk a goat and to handle the milk properly afterwards. I start out by getting the goat on the milk stand and locking the head gate. This is easiest to do with a little feed for motivation. Our milk stand head gate has a piece of wood that slides from side to side. We use a bolt to hold it in place with the goat’s head locked in it. Now, I gently pet and rub the goat while talking lovies to her. This makes her relax and settle in for the milking. Plus, I just like to love on my goats. Some goats start out a little nervous but after some petting, they calm down and relax. 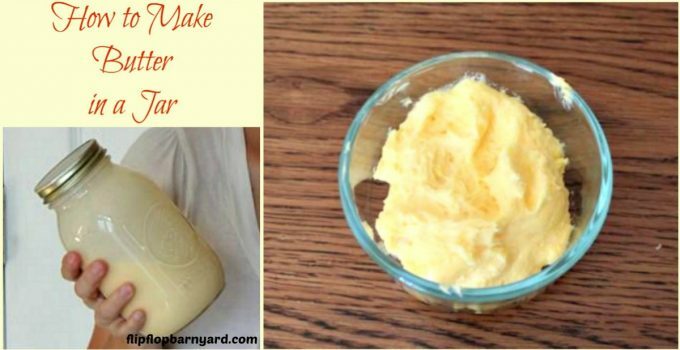 I use a wet rag dipped in a bucket of warm water with a touch of liquid castile soap and some essential oils in it. I gently clean and massage the udder, this does 2 things- cleans the udder (obviously), and it helps the goat let her milk down for me. 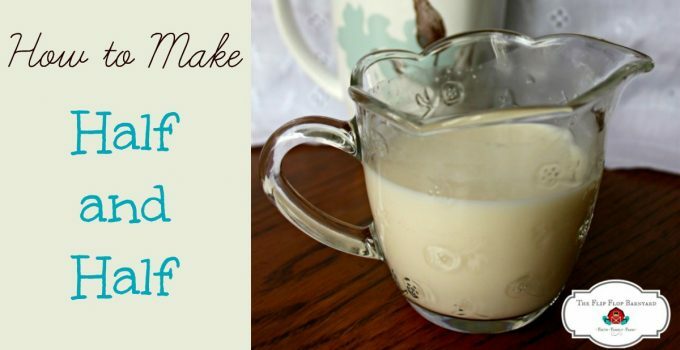 You definitely don’t want dirt and debris in your milk. I’m ready to begin milking now. I start by squirting 1-2 squirts of milk out on the milk stand to make sure it looks normal with no signs of mastitis or anything off about it. If you see any chunks or thick/stringy milk, you may need to test for mastitis. Once I am sure the milk is nice and clean, I start milking my goat. To do the actual milking, I grasp the top of the teat close to the udder and gently close it off, trapping the milk in the teat. I now gently squeeze my fingers closed starting at the top to bring all of the milk down and out of the teat. You want to empty the milk out of the teat with each squeeze. Be sure that you’re closing off at the top so the milk doesn’t “backwash” in the teat back to the udder. I milk straight into a small pail and continue milking until the udder is empty. 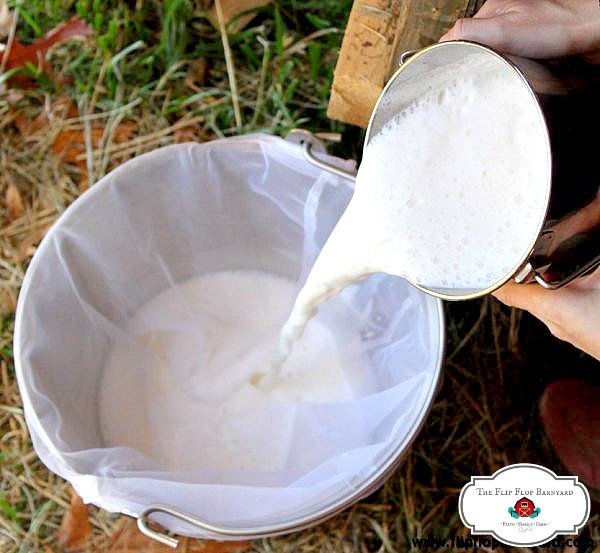 You’ll know when it is done because the milk will no longer come out easily and will only be a very small amount upon each squeeze. I also stop and massage the udder several times during milking to encourage all of the milk to come down. Once I’m done, I strain the milk and get it ready for putting in the fridge. 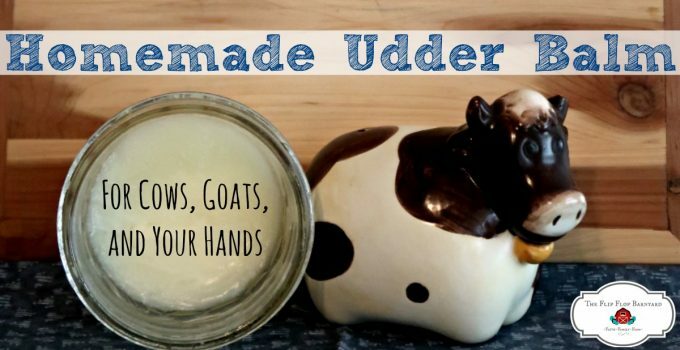 I like to rub my homemade udder balm on my goat’s teats to keep them healthy and supple. Now, I let my goat off the milk stand and put her back in the pasture. I think that milking dairy animals is my favorite chore. I use the term chore loosely because, if I enjoy it so much, is it really chore? I just love the time spent with the animals and with whichever family member(s) join me while I’m milking. I don’t ever want to go without a dairy animal on our property again. I just see so many benefits in so many ways from keeping dairy goats and cows. Hey, y’all! I’m Jenna, wife to my amazing husband, Derek, mom to 8 beautiful farm kids, homesteader, homemaker, homeschooler, and lover of Jesus. I enjoy all things farmy, family, crafting, old fashioned, and homemade. Learn to naturally raise your livestock today!Click Here to Learn More!